One of the best things about cruising is feeling the warm sun on your back and listening to the lull of the ocean waves. What's even better? Enjoying those things while eating a delicious meal. 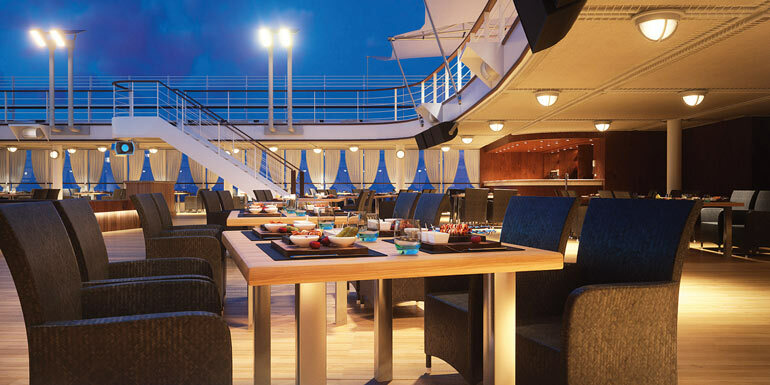 We rounded up seven outdoor dining venues that you have to check out on your upcoming cruise vacation. Overview: This Latin restaurant by Iron Chef Jose Garces gets its name from a Spanish colonial city in Cuba. 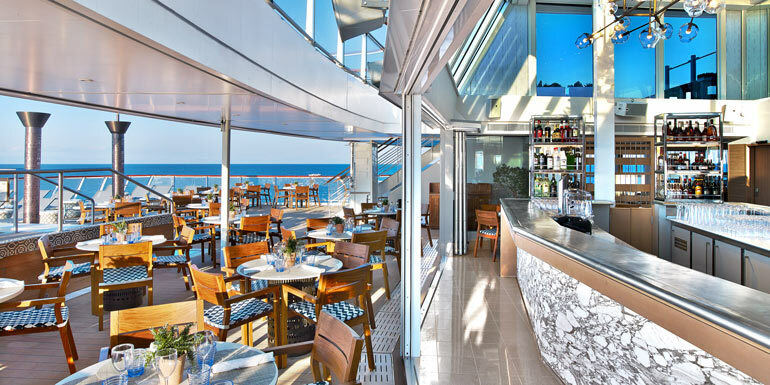 Seating is available both indoors and on the ship’s Waterfront promenade, giving you an ocean view while you dine on expertly prepared seafood dishes. Menu Highlights: Enchilado de Langusta (lobster served with a spicy tomato sauce over rice) and Bife de Chorizo (Wagyu sirlon with potatoes and beet sauce). For dessert, try the Milhojas de Cafe y Chocolate - a stacked coffee and chocolate dessert with layers of decadent cream. Overview: As the sun goes down, the outdoor Pool Bar & Grill transforms into the Black Rock Grill. A preheated volcanic rock is brought to each table, so you can cook your own dinner from a variety of meats exactly the way you’d like. Don’t worry about dressing up either; this venue is resort-casual and located on the pool deck. Menu Highlights: You can choose to grill filet mignon, lamb chops, veal, New York steak, pork chops, salmon, prawns, and more. There are also starters and sides, and the wine, as always, is complimentary. 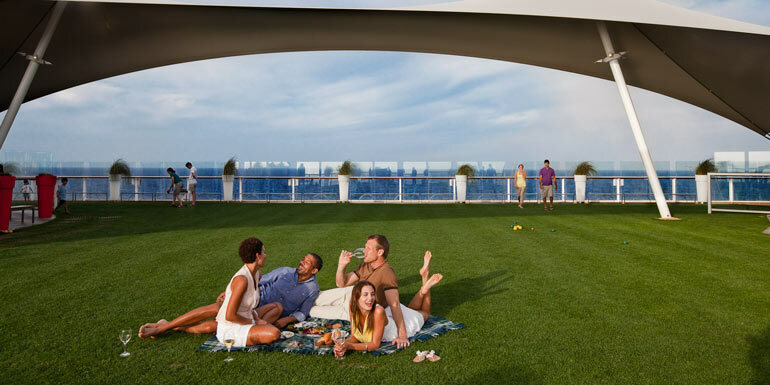 Overview: On the Ocean ships, this al-fresco dining experience is at the stern of the ship and is the perfect casual spot for relaxing in the sunshine during the day. Just bring your meal outside from the Pool Grill or World Cafe and enjoy the ocean views. In the evening, the venue is transformed into a casual bistro and offers table service, as well as a selection of delicious dishes from the buffet. On the river ships, the terrace is at the bow and offers a light buffet lunch, with table service at dinner. Menu Highlights: Crab legs and jumbo shrimp from the World Cafe, and a hearty Reuben from the Pool Grill. 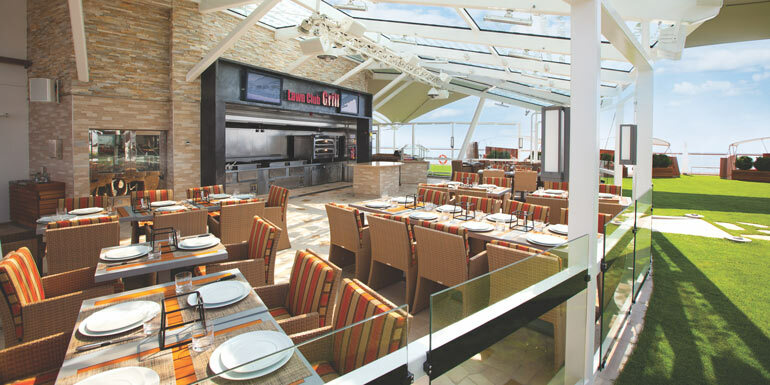 Overview: This bright, casual, and modern venue boasts custom-built outdoor grills so that guests can hear, see, and smell their meals being prepared. The venue is right next to real green grass, which enhances its backyard barbecue atmosphere. A highlight here is the opportunity to become your table’s “Grill Master,” where you’ll be paired with a chef to assist in preparing your group’s selections. Menu Highlights: Grilled beef, seafood, poultry, and vegetables, plus an a la carte build-your-own pizza station and gourmet salad bar. 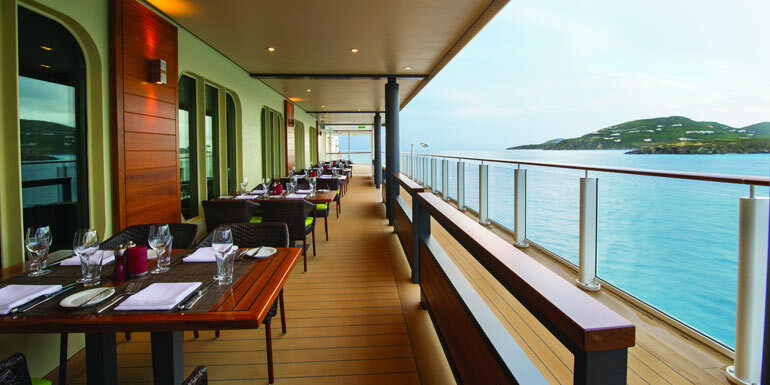 Overview: While all three Cunard ships have Princess Grill, only two boast an outdoor dining area. French doors open up from each a la carte Grills restaurant to the open patio area, and you may choose to step up another deck to the terrace for an even more intimate mealtime experience and sweeping views of the sea. Also note: The Grills restaurants are only available to guests that stay in Grill suites. Menu Highlights: Confit of Duck Ravioli (with roasted pine nuts, burro fuso, and madeira glaze), Jumbo Shrimp Provençal with Pilaf Rice, and for dessert, try the Coconut and Passion Fruit Cheesecake or Crème Brûlée Tart with Cinnamon Ice Cream. 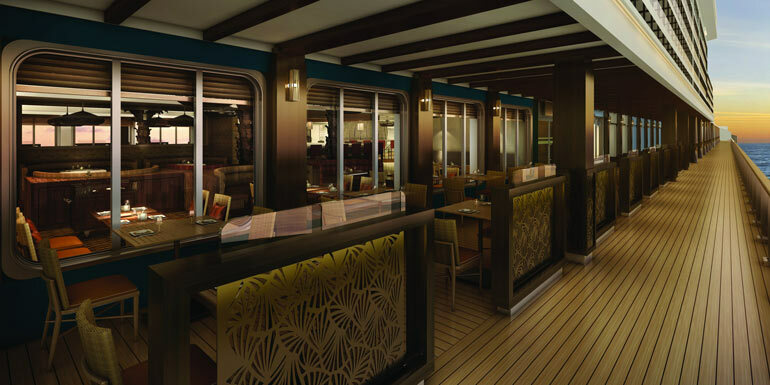 Overview: Cagney’s Steakhouse is found on all ships except Norwegian Joy, but only the Breakaway, Getaway and Escape offer an outdoor seating option. 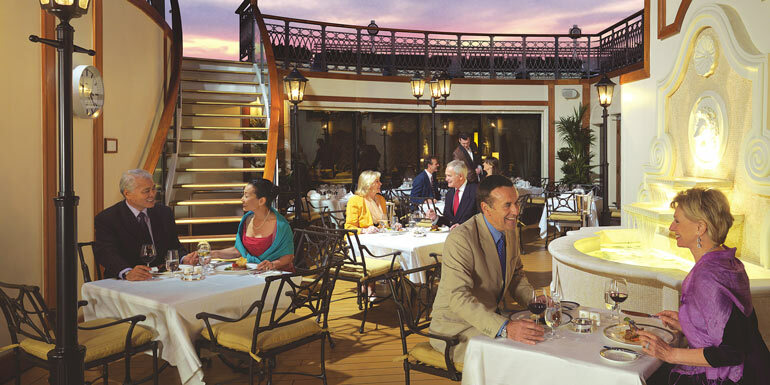 The American-style steakhouse is located on the ship’s oceanside promenade The Waterfront. Menu Highlights: Prime rib, filet mignon, surf & turf, jumbo crab cakes, and truffle fries. Don’t miss the raspberry crème brûlée for dessert. 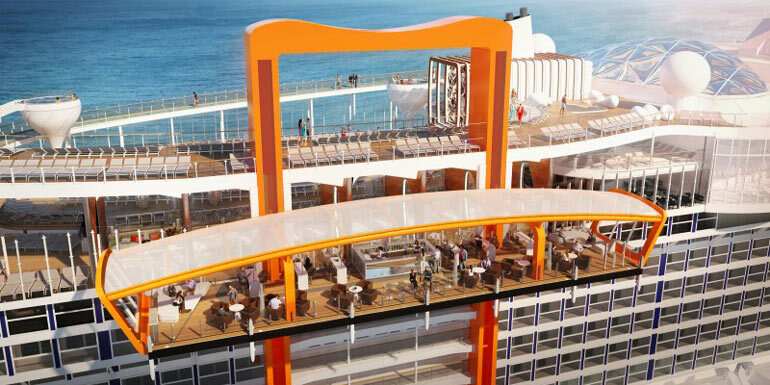 Overview: The innovative Magic Carpet on Celebrity Edge will offer a “Dinner on the Edge” specialty dining experience for 90 lucky passengers that promises the best views on the ship. Menu Highlights: To be announced. We can’t wait for this one to debut in 2018. What's your favorite outdoor venue?